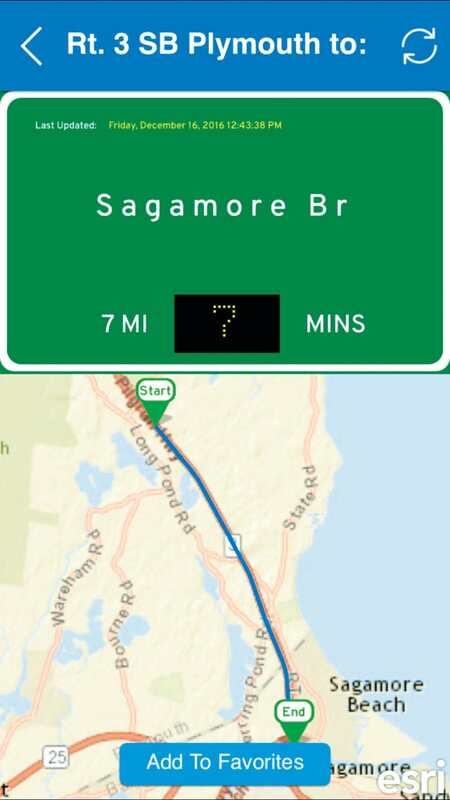 The GoTime app displays the travel times shown on both permanent and temporary electronic highway signs. One of the objectives for the Massachusetts Department of Transportation (MassDOT) is to create a cleaner, more efficient, and sustainable transportation system. To aid in achieving that goal, MassDOT developed the Real-Time Traffic Management (RTTM) system, which consists of 137 digital signs that display live travel times to 300 destinations and are placed on more than 700 miles of highway throughout the state. The department estimates that 2.2 million motorists view these signs each day. While the RTTM system provides valuable real-time information to commuters during their travels on the state’s roadways, MassDOT recognized that this information could also be used for pretrip planning. So the department decided to deploy a modern, publicly accessible, and stable mobile companion app: GoTime. And it needed to make it available quickly. Given its long history of executing successful projects with MassDOT, Esri partner VHB was tapped for the job. A transportation planning and engineering company with 23 offices stretched out along the entire East Coast of the United States, VHB has been a designated Esri ArcGIS Online specialty partner since 2015. The company’s applied technology (AT) team focuses on developing geospatial web, desktop, and mobile solutions. Thus, designing, developing, and deploying a native iOS and Android app fast was a challenge that VHB was ready to tackle. VHB quickly identified the critical project constraints, which were a short time-to-market window coupled with a native code requirement for both iOS and Android. Having flagged up these key driving factors, VHB reached out to Esri to explore whether AppStudio for ArcGIS would work to build GoTime. 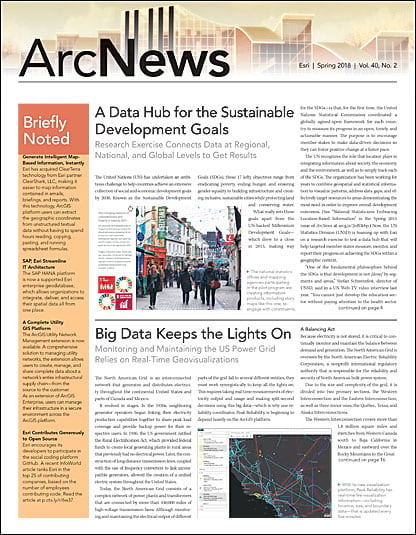 With assistance from Esri, VHB identified the unique opportunity that using AppStudio for ArcGIS would provide, since it could achieve the goals of the project while mitigating the pressure of turning around an app quickly. The NB, SB, EB, and WB symbols denote which side of the highway the specific sign is on. The central advantage of using AppStudio for ArcGIS is that it is built on the Qt framework, providing developers with the ability to write just one code base and then publish to multiple native solutions—in this case, iOS and Android. The singular code base model allowed VHB’s AT team to quickly and cost-effectively complete iterative and collaborative design while still delivering a seamless user experience across multiple devices. “AppStudio was selected primarily because, with that tight time frame, we decided there was no way we were going to be able to build two separate code bases natively—one for iOS and one for Android,” said Larry Spraker, an applied technology manager at VHB. Another benefit of AppStudio for ArcGIS is that testing is integrated, so VHB was able to use iOS simulators and Android emulators to test its app without having to do it on multiple phones and tablets. Moreover, AppStudio for ArcGIS can create app installation files both locally and in the cloud, yielding even more efficiencies for VHB’s development team. Even after the app was released, the AppStudio for ArcGIS development environment continued to be advantageous because it allowed resource managers flexibility in assigning tasks. Since all developers on the team were skilled in the Qt framework, one developer could make an enhancement to the app that would manifest in both native code bases. This prevented tying up multiple developers for enhancements and upgrades. It took the VHB AT team just five weeks to conceptualize, develop, and launch the GoTime mobile app in the App Store and Google Play. Since going live in early 2017, more than 9,000 users across Massachusetts have installed the free GoTime mobile app on their iOS and Android devices. 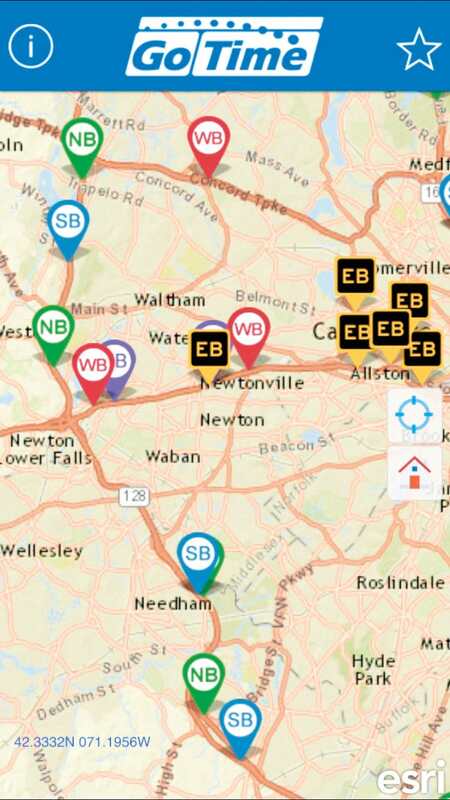 Using the app, drivers in Massachusetts can now quickly identify congested travel corridors and adjust their commutes accordingly. On a smartphone or tablet, a user can see the travel times shown on both permanent and temporary electronic highway signs. Map symbols labeled with NB, SB, EB, and WB denote which side of the highway each sign is on. When the user taps one of these symbols, the screen displays what is being shown on the highway signs. From there, the user can tap an arrow to see a map of his or her travel route from start to finish. With the ability to make better-informed travel decisions, drivers can improve their daily commutes and save time, gas, and money. These positive results directly align with MassDOT’s objective to create a more efficient transportation system. And with AppStudio for ArcGIS, VHB achieved its goal of successfully executing yet another on-time, on-budget project—this time, a native deployment of a geoenabled mobile app. Driving in Massachusetts anytime soon? Download GoTime.